Visit us at AloeTech, conveniently located at 514 New York Ave, Huntington Village and you will be sure you have come to the right place. We are a family owned & operated Auto repair center and take pride in our work. Our technicians are highly skilled, dependable and dealer trained. We provide top quality workmanship and are equipped with the same hi-tech tools and equipment equivalent or better than most dealerships. Our trained staff has the skills, experience & expertise to address any problem, to insure repairs are completed correctly and timely the first visit. Our facility participates in continuous training to maintain current knowledge of the rapid advancement in automotive technologies. We utilize the most up to date computer hardware and software to help diagnose and service your vehicle. Every repair and every customer is important to us, we want you leaving completely satisfied. We offer competitive pricing. Just give us the opportunity to review any quote and we can save you money on your repair and maintenance needs. The Lead Technician / Owner Franco Aloe, has received several recognized service excellence awards for his quality and thorough knowledge of automobiles. At the young age of 23 years old, Franco became an ASE-Certified Master technician and over the years a HONDA, ACURA and NISSAN specialist and he is also certified to work on Hybrid vehicles. One of Franco's many strengths is his ability in problem solving and troubleshooting electrical repair. He has over 15 Years of dealership training and over 20 years of hands-on learning. 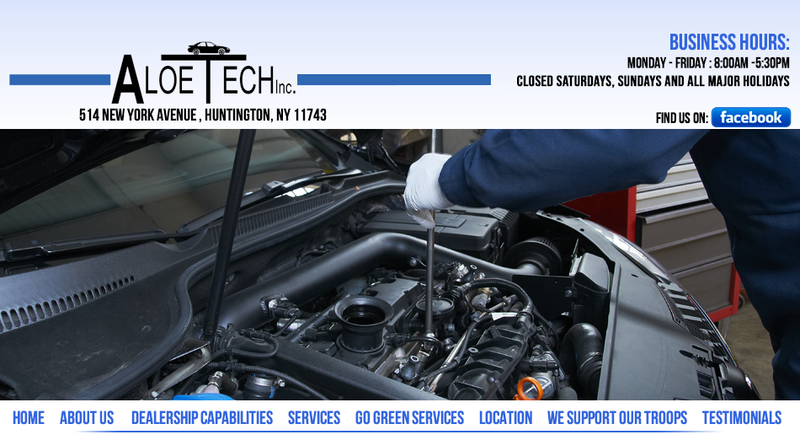 AloeTech's facility has the ability and tools to service all makes and models from vintage to Bentleys, foreign or domestic vehicles. Our shop is recognized by most insurance companies and also works directly with extended warranty companies. You can be sure your claim will be handled by us quickly and with little or no stress to you. We understand the importance of your time and offer an early bird / night owl key drop box service. We also offer local drop off and pick up of you or your vehicle. AloeTech provides a quick turnaround for all repairs and in most cases same day service. Our facility is a DMV certified repair shop, ASE certified & fully insured. We offer the dealership experience and equipment with that neighborhood friendly affordability. We accept all major credit cards; MasterCard, Visa and American Express.